medicine garden Archives - enviroscape inc.
July 3, 2018 by enviroscape inc. The Kimbercote Centre is designed for youth to explore and learn about nature. The 100 acre facility is situated in the beautiful Beaver Valley of the Niagara Escarpment lands complete with trails and plenty of spaces for outdoor education. The centre gives youth a chance to learn about the local ecosystem, recharge through natural play and learn about traditional customs from resident Elders and Medicine men. 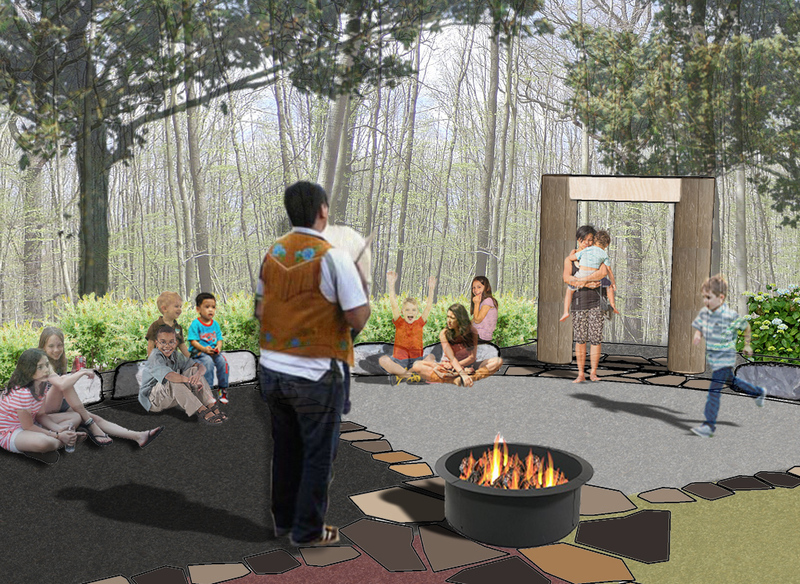 We are excited to partner with the Kimbercote Centre to expand their ability to teach youth about Indigenous traditions and enhance their natural connection through new landscape features. With the help of Abby Stek, Glenn Trivet, Peter Dunbar and Jim Collis, we are proud to display our vision and design for the medicine wheel outdoor classroom and garden. This will give further opportunity for Indigenous elders to explain their history and actively engage youth in traditional ceremony demonstrations. The garden surrounding the circular space will be complete with plant species that represent the medicine wheel coloration, are used as part of the customary ceremonies and are native species to the area. 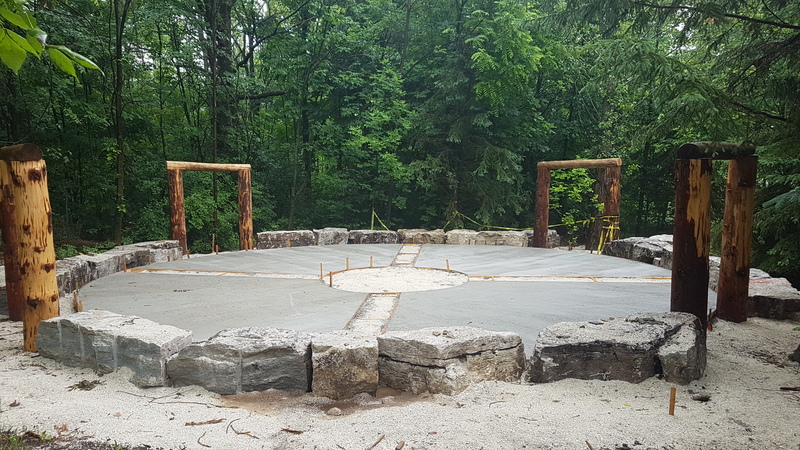 Now with this beautiful summer weather, the construction phase is in full swing and Peter and Jim have taken the vision from paper and begun creating this beautiful space nestled in the forest. We are thankful to be part of this influential project and glad to help educate youth about Indigenous traditions and the natural environment. We welcome your questions. Please get in touch with us, using the contact form on the left, call us or send us an email. Thank you for your interest in enviroscape. 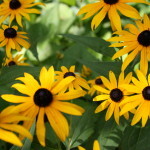 We are located 1.5 hours north of Toronto, between Mansfield and Creemore. We are 30 minutes from Collingwood (South, East), Barrie (West) and Orangeville (North East), in beautiful Mulmur Township. We post all our latest news on the blog. You can also join our mailing list and subscribe to our site, to receive posts by email. For over 35 years Ian Payne BLA has been creating healthy, sustainable and beautiful spaces for live, work and play. As a founding director of Enviroscape Incorporated (1976), he enhances the outdoor experiences of people all over South Central Ontario. Not content to rest there, he started the Not So Hollow Farm—cultivating a niche producing trees and shrubs native to Ontario. Located in the idyllic Purple Hills of Mulmur township, Ian has constructed a truly forward looking home-base utilizing innovative green construction methods by integrating recycled shipping containers and reclaimed materials. The perfect headquarters for Enviroscape and Not So Hollow Farm. Farmer, Innovator, Music lover, Techie, Vegan and Landscape Architect: Ian Payne is multifaceted. His lifestyle informs his creativity, which fuels his designs. Designs which will enrich both your lifestyle and enjoyment.